I had the pleasure of attending the European Large Lakes Symposium (ELLS) – International Association of Great Lakes Research (IAGLR) 2018 international conference entitled “Big Lakes, Small World” during the week of September 23-28, 2018 in Evian, France on the shores of Lake Geneva. The ELLS-IAGLR symposium drew scientists studying large lakes systems from around the world to the shores of Lake Geneva in Evian, France. This symposium was notable for many reasons, including being the first IAGLR meeting held outside of North America, in conjunction with the 5th European Large Lakes Symposium. I was impressed with the strong Great Lakes presence at ELLS. 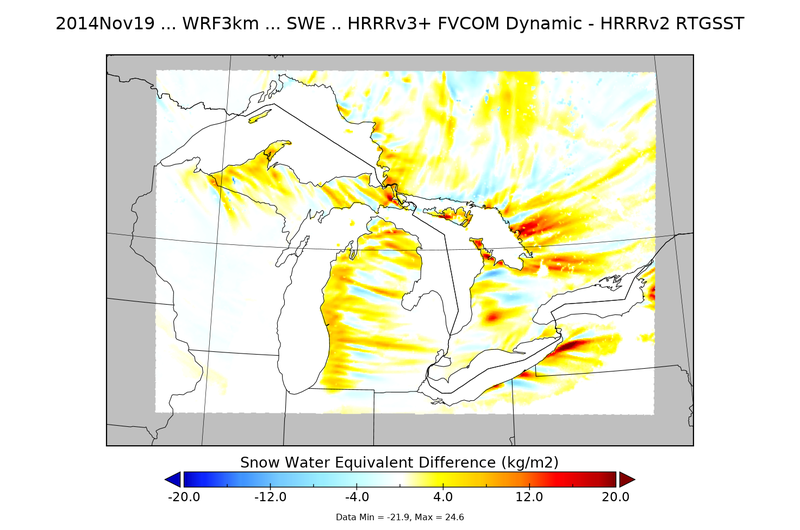 In addition to myself and Philip Chu representing the NOAA Great Lakes Environmental Research Laboratory (GLERL), colleagues from the Cooperative Institute for Great Lakes Research (CIGLR)—Tom Johengen, Dmitry and Raisa Beletsky—also attended. There were also a number of our Laurentian Great Lakes partners from around the basin participating in the symposium. Like French cuisine, the conference “menu” was jam-packed with scientific gourmet entrees, which we gorged on each day from 8:45 in the morning until after the poster session concluding at 7:00 each evening. The conference was held in the historic Palais Lumiere (below), formerly a bathhouse, circa 1902, converted into a convention and cultural center in 2006—where better to hold a conference focused on water? The symposium was held at the historic Palais Lumiere formerly a bathhouse, circa 1902, converted into a convention and cultural center in 2006. Presentations featured an array of topics, including the chemical, physical, and biological aspects of lakes exotic as the Amazonian floodplain lakes and Russia’s Lake Peipsi, as well as those large lakes familiar to us, such as the Great Lakes, Lake Champlain, and Lake Tahoe. Common issues of concern raised during the symposium involved the dynamic changes caused by multiple stressors, namely, increasing temperature, human populations, invasive species, and harmful algal blooms. One observation that I’m excited to report is the number of times NOAA data, products, and services were referenced in talks—a telltale sign that scientists worldwide are relying on NOAA expertise. Items ranged from a Great Lakes sticker on monitoring equipment to the use of graphics like NOAA global surface temperature maps and GLERL food web charts (twice!). I also spotted a quote pulled from our 5-year science review and even one from our venerable Craig Stow (see image below). I counted at least 18 presentations that cited a connection to NOAA. As a Great Lakes stakeholder attending this international symposium, I would like to convey to our Great Lakes partners from around the region that we, as a community, can take pride and satisfaction that our daily work results in global impact on large lakes—small world! Philip Chu with Ph.D candidate Theo Baracchini and Dr. Shubham Krishna of Physics and Aquatic Systems Laboratory, Swiss Federal Institute of Technology. CIGLR scientist, Dmitry Beletsky, presents at ELLS on a CIGLR/GLERL research project to advance hypoxia forecasting. Categories: Communication, Event | Permalink. Dave Fanslow stands with GLERL’s fluoroprobe. Dave Fanslow is a GLERL biologist of 25 years. 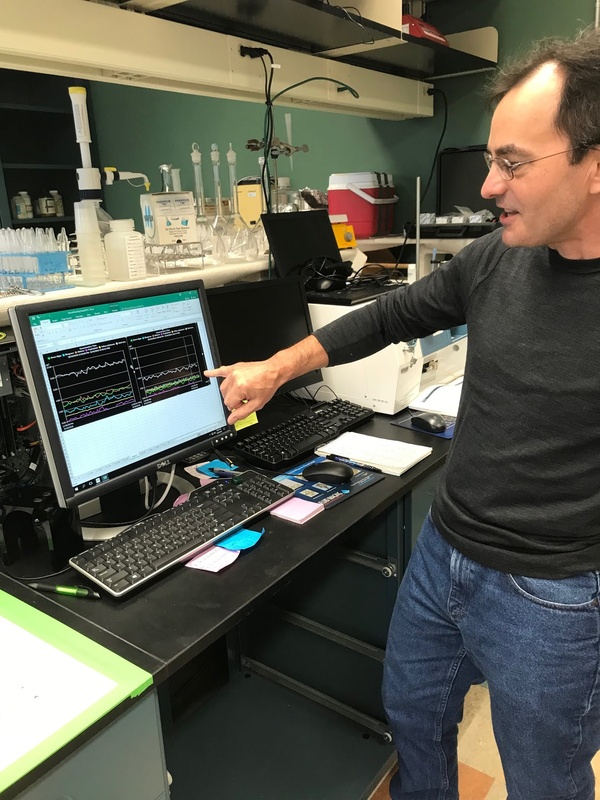 He’s basically done it all, but these days he takes care of the lab’s fluoroprobe – a special instrument that measures different types of algae using light beams. Read our interview with Dave to learn more about the fluoroprobe, along with a decades-old scientific mystery that still haunts him and a fear he had to overcome on the job. My job is to support the principal investigators with technical know-how in the laboratory. I spend a lot of my day working on instruments right now – the flowcam and the fluoroprobe — which are both used to assess and describe HABs, or harmful algal blooms. The fluoroprobe is a new device that uses LED lights that trigger a response from the algae, which have unique pigments in them that respond to very distinct wavelengths – so it’s able to distinguish between types of algae simply by flashing an LED light as you pull it through the water. It first came out in about 2014. We had one of the first here at GLERL. The most interesting thing that I worked on was actually an unresolved question, the disappearance of the Diporeia from Lake Michigan. There was an amphipod organism called Diporeia that is still present in tiny numbers but used to be really common, and was the basis for the lower food web in Lake Michigan prior to the expansion of quagga mussels. In the mid-90’s, those organisms plummeted from numbers of around 10,000 per square meter down to practically zero in the large majority of the lake. There was some assumption of effect by zebra mussels and quagga mussels, but we never did really figure that out. The change in the food web was occurring anyway, where quagga mussels were going to take over and dominate the system…so the exact reason for the disappearance of the Diporeia didn’t really matter in the ultimate outcome. But, it was a mystery that piqued my interest and I wish we had been able to describe it. It may have been relevant for some other instance. If it was a disease, if it was an invertebrate disease that was introduced by some other invasive species, that’s a form of microbiological pollution, and it would’ve been nice to nail that down and figure that out. The hardest part about doing what we do is the disconnect that I sometimes feel exists between policymakers and scientists. And, I know that’s something that scientists and researchers have struggled with forever, it’s not new, and it’s an ongoing problem to communicate the issues and hope that policymakers make good decisions based on good information. Most of my inspiration comes from encounters with the public, family and friends who are invariably enthusiastic and concerned about the Great Lakes. People in Michigan in particular, it’s part of our identities, and so that’s where I get my motivation because I know people care. Dave Fanslow explains some data coming from the fluoroprobe. There’s a fun story about a fear you had to overcome to do this job. Can you tell us about that? When I first got the job interview, I was told that they wanted me to do scuba diving to collect zebra mussels. This was at the very beginning of the zebra mussel invasion in 1992. I wasn’t super comfortable with swimming and the water, but I thought I would check it out. So I did my research, read about it, went to the pool and practiced, and said yeah I’ll take the job. Then I got trained at NOAA diving headquarters in Seattle where they have retired Navy Seals conducting the training. Then, I conducted over 500 dives over the next 6 or 7 years, mostly related to collecting zebra mussels and then also in the early stages of the Thunder Bay Marine Sanctuary, observing some of the wrecks and establishing moorings up there. How would you advise young people interested in science as a career path, or someone interested in your particular field? My general advice would be that they be flexible in terms of not narrowing down their discipline too much until they get out in the field and discover what the opportunities are. I know that in my career, what I have worked on, the area of technical expertise has ranged wildly over the 25 years I’ve been at GLERL. From picking bugs initially, to measuring lipid content, to measuring enzyme content in mussels and Diporeia…to now I’m working with electronic instruments. So, be flexible. Well, one thing I think that people tend to assume about scientists is that they’re eggheads who are narrowly focused on their own work to the exclusion of the rest of the big questions about what’s going on in the environment and in society in general. So, scientists are well-rounded and multi-dimensional people too. When I’m not at the lab I have raced my bike a lot over the years, starting when I was an undergraduate. I am now kind of transitioning into middle age and doing other things like gardening and canoeing and fishing. Usually it involves being outside in the environment and making observations about the plants and the bugs and the weather and the things that are around me. We have a place on Lake Superior, and just being there and seeing the change in the weather from day to day and hour to hour is a blast; it’s one of my favorite things.